[CLOSED] WIN AN ADVENTURE! TELL US YOUR PERFECT DAY OUT AND YOU COULD WIN £125 VIRGIN EXPERIENCE DAY VOUCHER! At The Insurance Emporium, we believe that adventure is the spice of life and creating magical memories is one of the most important things you can do! Just take our friend Mr Benn, who has found himself everywhere from sailing the seven seas on a pirate adventure to wandering around the Wild West! We want you to enjoy as many adventures of your own as you can, that’s why we’re giving away two £125 Virgin Experience Days vouchers! Whether it’s indoor skydiving, a bungee jump or potential pain at paintball, there are all kinds of adventurous experiences to choose from! If going wild isn’t your idea of an enjoyable adventure, you can always take your taste buds on a journey with a fine dining experience or kick back with some luxury spa treatments. After all, everything in life can be an adventure! To enter, we simply want to know what your perfect day out would look like! Just click on the link below, fill in your details and let us know what your dream adventure is to be in with a chance of winning one of two £125 Virgin Experience Days vouchers! It could be anything from getting a seat on the first passenger flight into space to exploring your culinary dreams at a Michelin starred restaurant! 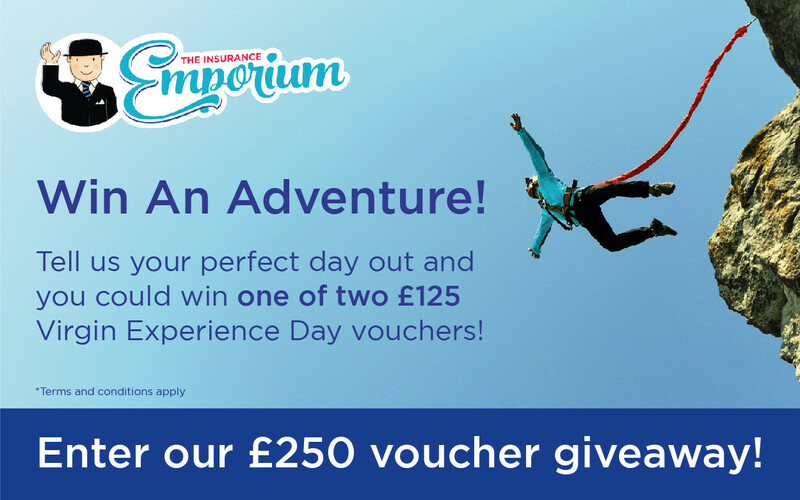 The Insurance Emporium is a one-stop-shop helping you to cover your passions and adventures in life! We believe that you should be able to enjoy life to its fullest and nothing should get in the way of that, including the worry of something going awry! From cover for cycling to golf equipment insurance, fishing insurance to wedding insurance and much more, you can find it at The Insurance Emporium! This blog is in no way sponsored, endorsed or administered by, or associated with Virgin Experience Days.